Yesterday, during a visit to the Aintree University Hospital in Liverpool, England, William discussed what life is like in the royal household and confessed Charlotte, not Prince George, is the one he needs to keep an eye on. “George rules the roost but Charlotte isn’t far behind. I think she’s going to be trouble when she’s older. All fathers say that to me—watch out for the little girls,” he said. 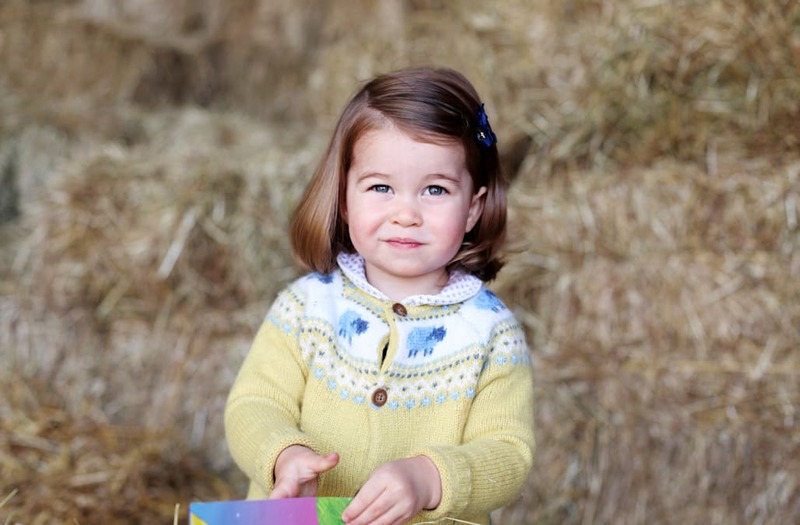 Britain's Princess Charlotte, daughter of the Duke and Duchess of Cambridge, Prince William and his wife Catherine, poses for a photograph taken by her mother, at Anmer Hall in Norfolk. Handout photo released by the Duke and Duchess of Cambridge of Princess Charlotte taken by the Duchess at Anmer Hall in Norfolk in April. The Duke of Cambridge cuddles Princess Charlotte, as the Duke, Duchess and their family enjoy a short private break skiing in the French Alps. The Duke and Duchess of Cambridge with their children, Princess Charlotte and Princess George, enjoy a short private break skiing in the French Alps. The Duke and Duchess of Cambridge with their children, Prince George and Princess Charlotte, during a short private break skiing in the French Alps. The Duke and Duchess of Cambridge with their two children, Prince George and Princess Charlotte, in a photograph taken late October at Kensington Palace in London. In a handout photo provided by HRH The Duchess of Cambridge, Princess Charlotte of Cambridge plays with a teddy as she is seen at Anmer Hall earlier this month taken by Catherine, Duchess of Cambridge in Sandringham, England. In a handout photo provided by HRH The Duchess of Cambridge, Princess Charlotte of Cambridge is seen at Anmer Hall earlier this month taken by Catherine, Duchess of Cambridge in Sandringham, England. Princess Charlotte of Cambridge is pushed in her silver cross pram as she leaves the Church of St Mary Magdalene on the Sandringham Estate for the Christening of Princess Charlotte of Cambridge on July 5, 2015 in King's Lynn, England. Catherine, Duchess of Cambridge and Princess Charlotte of Cambridge arrive at the Church of St Mary Magdalene on the Sandringham Estate for the Christening of Princess Charlotte of Cambridge on July 5, 2015 in King's Lynn, England. Catherine, Duchess of Cambridge, carries Princess Charlotte of Cambridge as they arrive at the Church of St Mary Magdalene on the Sandringham Estate for the Christening of Princess Charlotte of Cambridge on July 5, 2015 in King's Lynn, England. Catherine, Duchess of Cambridge, Prince William, Duke of Cambridge, Princess Charlotte of Cambridge and Prince George of Cambridge talk to Queen Elizabeth II, Prince Phillip, Duke of Cambridge and Camilla, Duchess of Cornwall as they arrive at the Church of St Mary Magdalene on the Sandringham Estate for the Christening of Princess Charlotte of Cambridge on July 5, 2015 in King's Lynn, England. Princess Charlotte of Cambridge is pushed in her silver cross pram as she leaves the Church of St Mary Magdalene on the Sandringham Estate after her Christening on July 5, 2015 in King's Lynn, England. Handout photo released by the Duke and Duchess of Cambridge of Prince George and Princess Charlotte. The photograph was taken by the Duchess in mid-May at Anmer Hall in Norfolk. The Princess of Cambridge in the arms of her mother the Duchess of Cambridge outside the Lindo Wing of St Mary's Hospital in London. Charles, Prince of Wales leave Kensington Palace the day after the birth of The Duke And Duchess Of Cambridge's daughter at Kensington Palace on May 3, 2015 in London, England.